At my new job, one of the programs I'm doing is a book club for tweens grades 4-6. 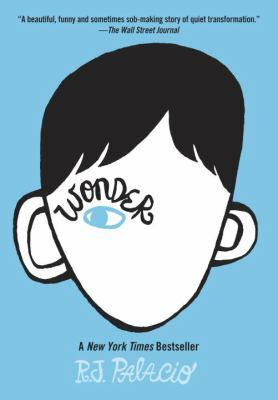 April was my first time leading it and the book selection* was Wonder by R.J. Palacio. The kids seemed to like it well enough but no one raved about it. Here's a little background on how the book club works. We meet once a month, during the school year only, on a Monday evening at 6. The library provides dinner (pizza) and a drink (Capri Sun or pop--NOT SODA). The books (usually paperbacks, but not with Wonder since it was only available in hardcover) are purchased out of the library's programming budget and are only used for book clubs system-wide (often, summer reading prize books are added into this collection). The kids register and there's usually around 5 kids, which is a small program for us but easily managed. For Wonder, I printed off the book discussion group questions from the author's site. I also made a playlist for the book's trailer and some of the songs quoted in the book on YouTube as I didn't think the kids would be too familiar with some of the lesser known songs. The kids spent most of the time working on the word search I made made using names from the characters and concepts from the book (like precepts) and getting to know each other. We also talked about the precepts and what ours would be. *Both April and May (Unsinkable by Gordon Korman) book club selections were made by my predecessor before I came on board. Luckily for me, I'd already read and liked them both before I started but re-read to freshen my memory. I'm a huge Gordon Korman nut (and have been since high school when I read Don't Care High!) so I am looking forward to the end of the month when we talk about that book. I really enjoyed our first book club meeting! I am starting something like this for the summer and hopefully merging it into the fall. It's a nice low key but still engaging program I think. I've been finding at my library that kids check Wonder out, but it's the parents who end up reading it, loving it, and returning to the library to rave about it to me. It sounds like you had a great book discussion, and I look forward to hearing about the book club for Unsinkable!